Castellano is a member of the Florida Bar, District of Columbia Bar, and the State Bar of Texas. She is admitted to practice before the U.S. District Courts for the Southern, Middle, and Northern Districts of Florida. 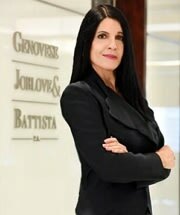 Castellano earned her juris doctor degree from South Texas College of Law, where she was on the Dean's List, was the Director of Mock Trial Competition, the assistant director for the ABA Arbitration Negotiation Competition and was a director of the Board of Advocates. She is a graduate of the University of Florida, with a bachelor of science degree in business administration and was active in the Florida Blue Key.